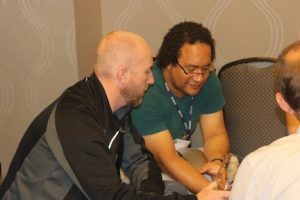 Continuing the SIGUCCS tradition of communicating with colleagues and sharing information there is an email list you can join. This list provide a forum for the discussion of all aspects of information technology services. You may also communicate with SIGUCCS Board members. This SIGUCCS discussion list was established upon the request of SIGUCCS conference attendees for a mechanism to communicate with colleagues. This list is great place to ask questions. To subscribe and manage your subscription, visit this web page. This SIGUCCS discussion list is used to send messages to SIGUCCS members only. All SIGUCCS members are automatically subscribed upon joining SIGUCCS. You can also send email messages to the SIGUCCS Executive Committee. Messages sent to siguccs-board@listserv.acm.org will be received by all members of the Board.